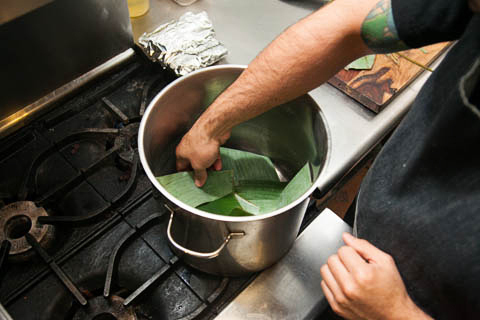 For many Latin Americans, the holidays are tamale-making season. 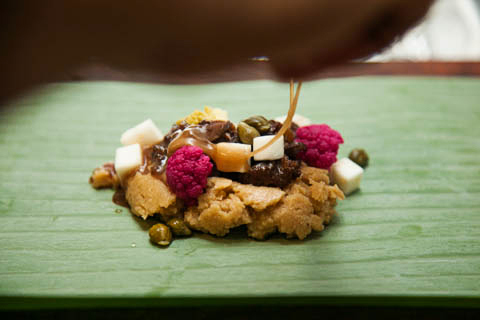 Because we’re weirdos, we wondered what would happen if you mashed up some Hallmark Christmas flourishes—like reindeer and baking spices—with a traditional Christmas tamal. 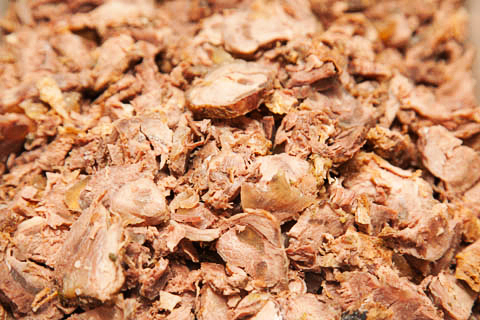 To help us realize our “fucked-up, literal Christmas tamale” dream, we called up Eddie Ruiz, the Salvadoran chef at L.A.’s Corazon y Miel known for expanding the Pan-Latin purview with rule-breaking delicacies like fried head-cheese tacos, 2lb. bone-in braised turkey leg sandwiches, and his namesake seared chicken hearts dressed in honey. 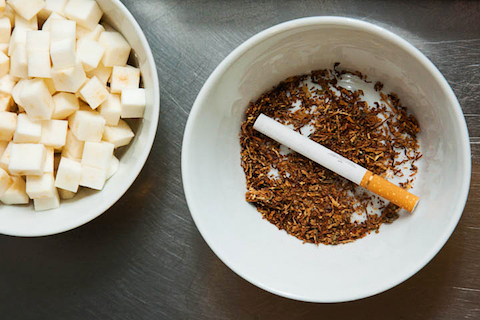 The chef cautions, “This is not a dish for someone who wants to have a healthy Christmas. 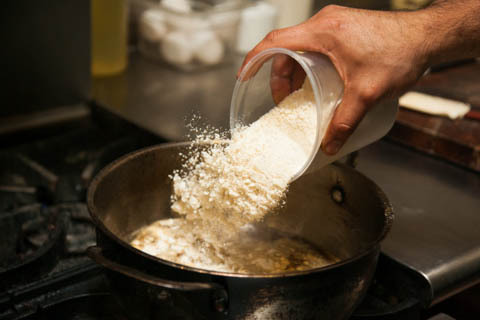 You’ll see how much fat goes into the masa.” Ruiz used Wagyu beef fat to keep it from being dry—because that’s how he rolls—but you can use lard, duck fat, or regular suet. 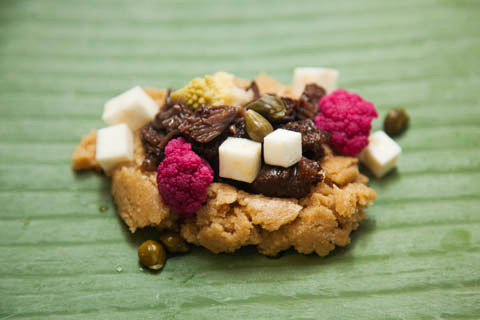 He also incorporated the reduced reindeer braising liquid into the tamal dough for additional flavor. NOTE: Reindeer (or caribou) meat is available online at americanpridefoods.com. 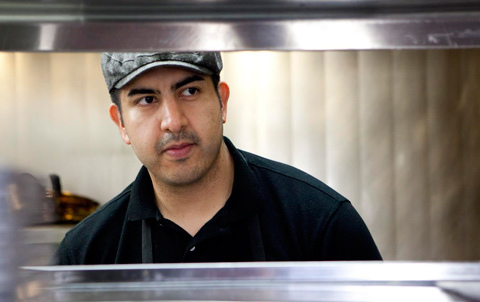 NOTE: “You have to be 18 to eat this dish,” cautions Ruiz. Step 1: Start by searing the reindeer legs over high heat in oil until they are nice and brown. Take the legs out of the pan, then add the mirepoix to the pan and sautée until well browned. Next, add the red wine and bouquet garni (filled with toasted black peppercorns, bay leaf, garlic, thyme, and wet packing tobacco), and reduce by half. Transfer the contents into a roasting pan, add some chicken or vegetable stock, then place the legs into the roasting pan. Cover with a lid and roast low and slow in a 275°F oven for about 3.5 hours. 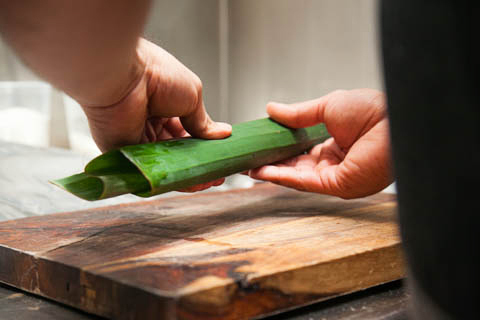 Once the meat is cooked, let it cool, pick the meat off the shank, and cut it into pieces. 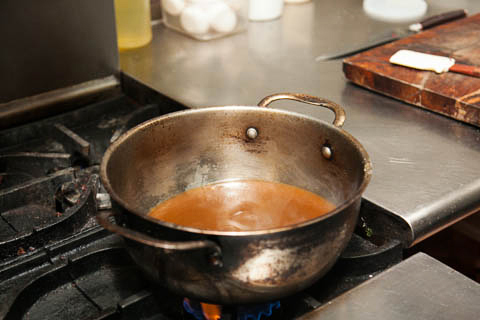 Reserve the braising liquid. 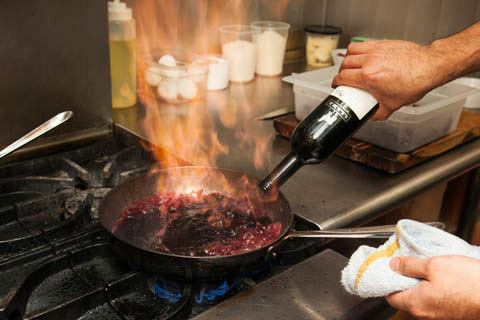 Step 2: Pour a bottle of red wine into a sauté pan, and reduce it until there’s ¼ of the original amount. Then, add reduced venison stock to the pan. Step 3: Add reindeer meat to the pan and let it boil together. 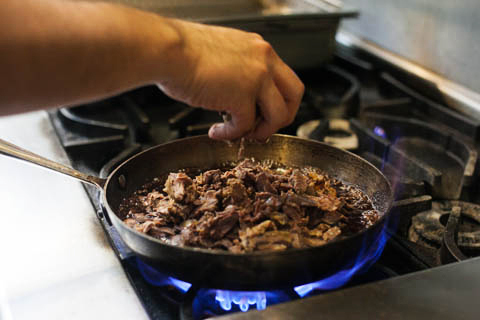 Step 4: Add a pinch of cinnamon, allspice, and clove to the pan, and let the meat and liquid cook until the sauce is concentrated and has a sticky consistency. It’s beginning to smell a lot like Christmas. 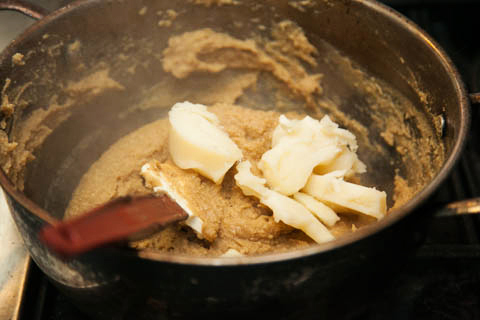 Step 5: Next, add “a shitload” of butter to the meat. 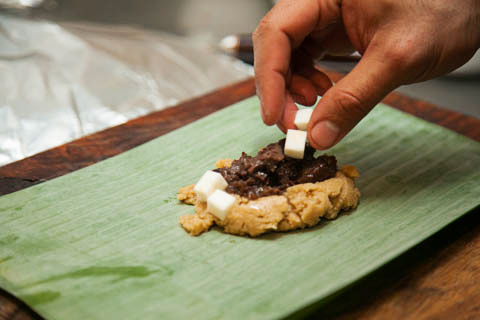 Ruiz says, “The butter is going to add richness; it’s also another way of making sure you don’t have a dry tamal. 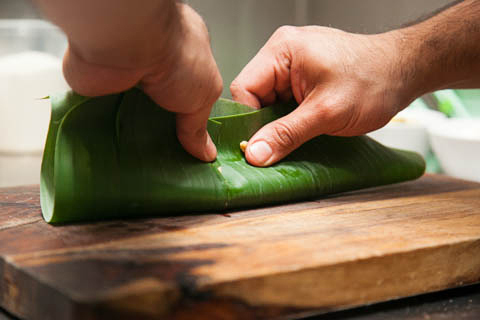 It’s also really pretty—the meat starts to change color and get glossy.” Salt the meat with a heavy hand; each element of the tamal needs to be well-seasoned. 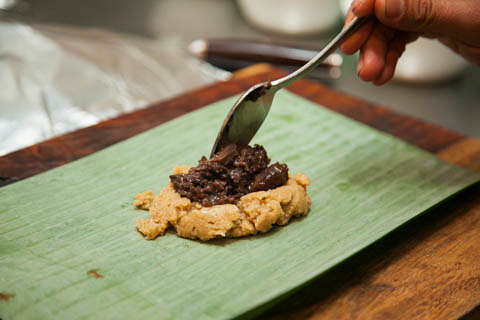 NOTE: Follow the recipe on the back of the masa de tamal bag for the liquid-to-dry masa ratio. 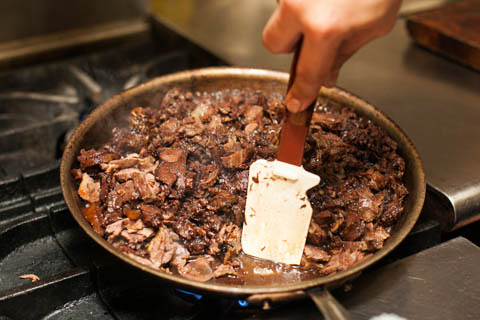 Step 1: Put the reindeer braising liquid (that was leftover from cooking the reindeer) in a pan, and reduce it. 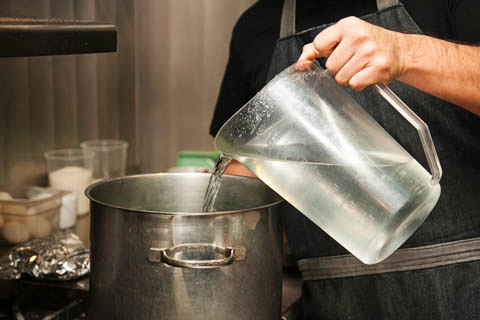 Dilute it with a bit of vegetable stock, and bring the liquid to a simmer. 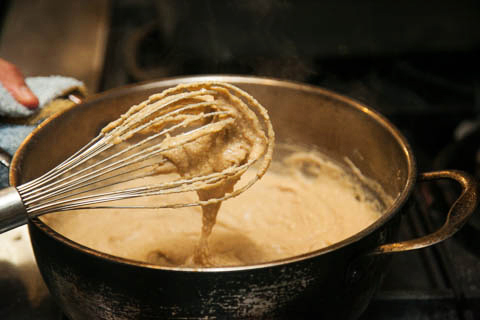 Step 2: Start to incorporate the masa de tamal into the hot liquid with a whisk (a little at a time so you don’t get clumps). 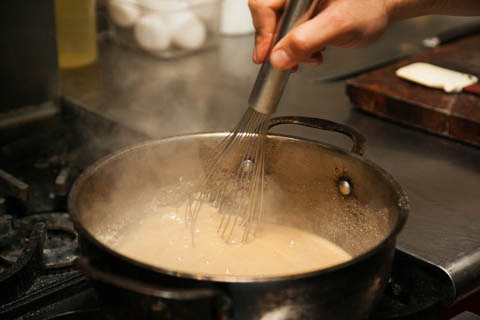 Step 3: Once the masa is added, continue cooking over medium-high heat. It will begin to thicken. Use a spatula to scrape down the sides. 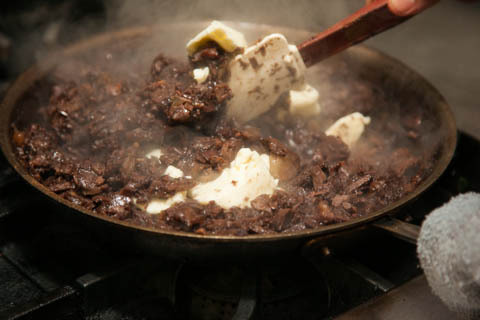 Step 4: Next, add the fat (lard, duck fat, and Wagyu beef fat work—but not shortening, because it has no flavor). 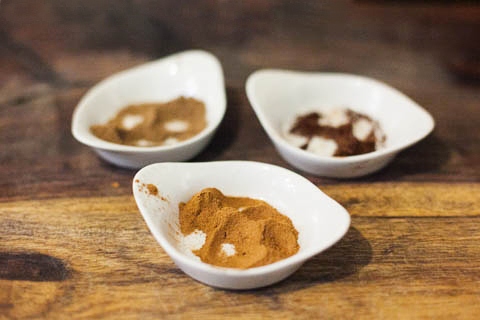 How can you tell the masa is ready to add the fat to? “If I run my spatula across it, it stands on its own,” says Ruiz. 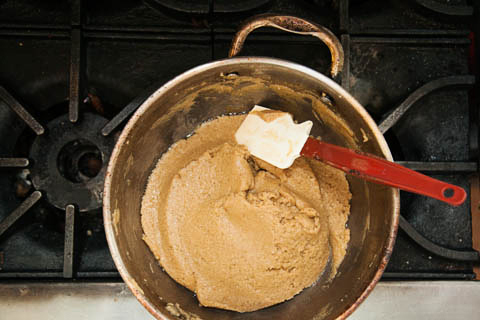 As the masa sits there in the pot while you’re making the tamales, it will thicken. 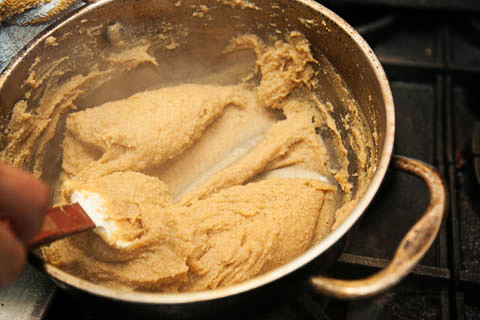 You will have to keep adjusting it and adding liquid every 50 tamales or so to keep the texture consistent. 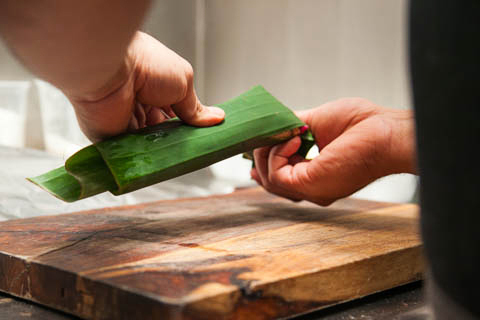 Step 1: Remove off the ends of the banana leaf, and cut them into rectangular sheets (the shorter side should be the length of your hand). 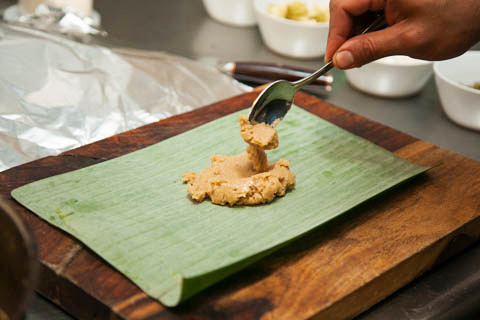 Step 2: Add two heaping tablespoons of masa in the middle of the banana leaf, and make a little divot in the masa with your spoon. 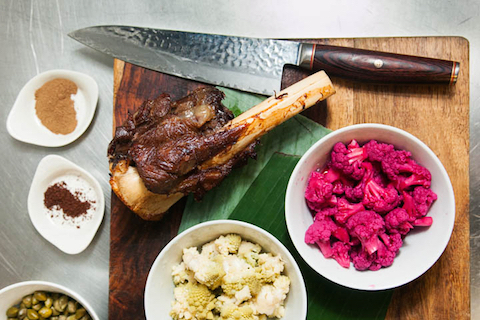 Step 3: Add the reindeer meat, then the celery root, capers, pickled romanesco, and pickled purple cauliflower, and a spoonful of the reduced reindeer cooking liquid. 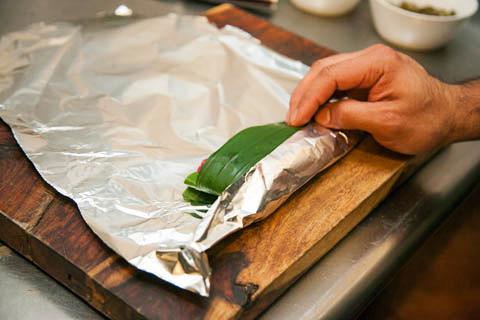 Step 4: Fold sides of banana leaf over filling to make a snug rectangular package. 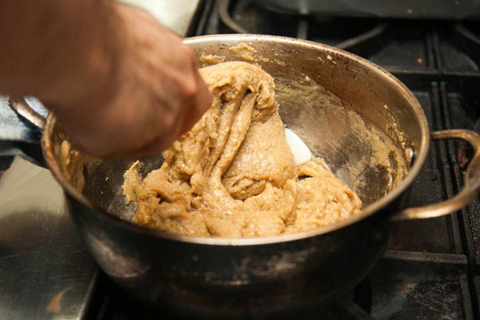 Repeat process with remaining dough, reindeer, and other fillings. 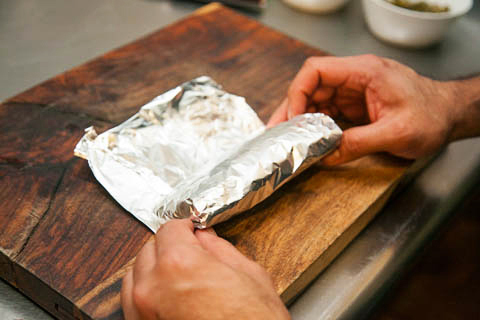 Step 5: Wrap in foil. 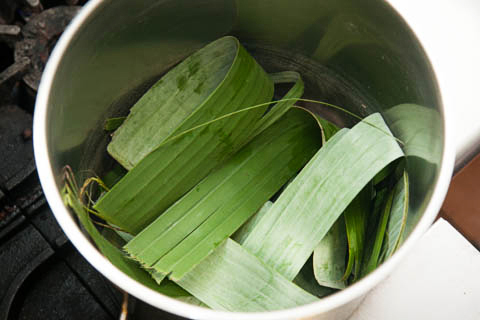 Step 1: A lot of people don’t have a double boiler, so here’s the indigenous way to do this: Cut little strips of the banana leaf and start to make a bed with the strips at the bottom of a large pot by zig-zagging them together. 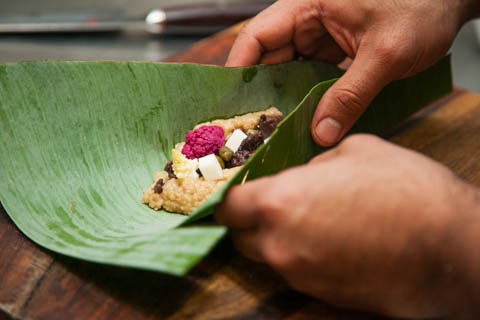 You’re creating an elevated bed for the tamales to rest on. 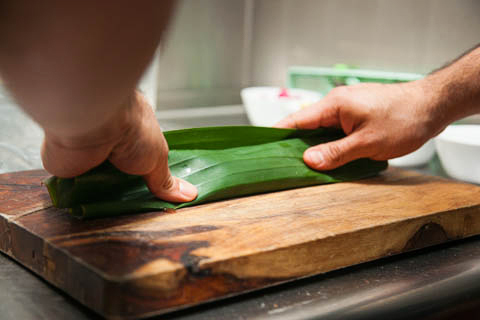 Step 2: Pour water in the bottom of the pot, but make sure it doesn’t reach the top of the banana leaves. You don’t want the tamales to touch the water. 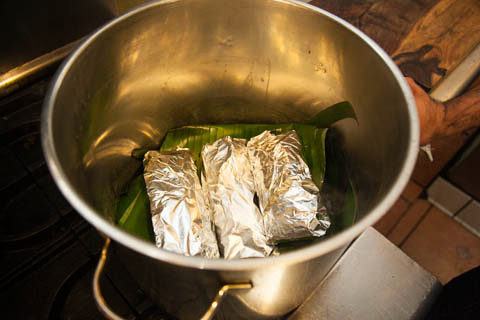 Step 3: Lay the tamales in the pot on top of the leaves, and cover. Steam over low to medium heat for 2.5 hours. 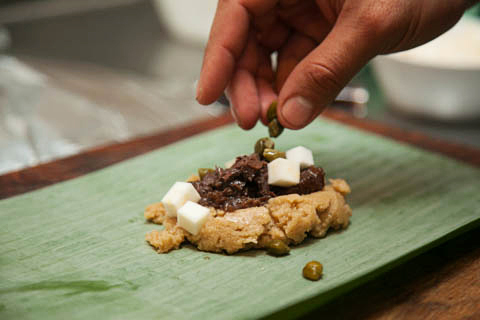 Garnish your reindeer Christmas tamales with a fried egg and shaved pickled cauliflower.